Salmon tacos are one of my favorite summertime meals! They are the perfect light dinner! 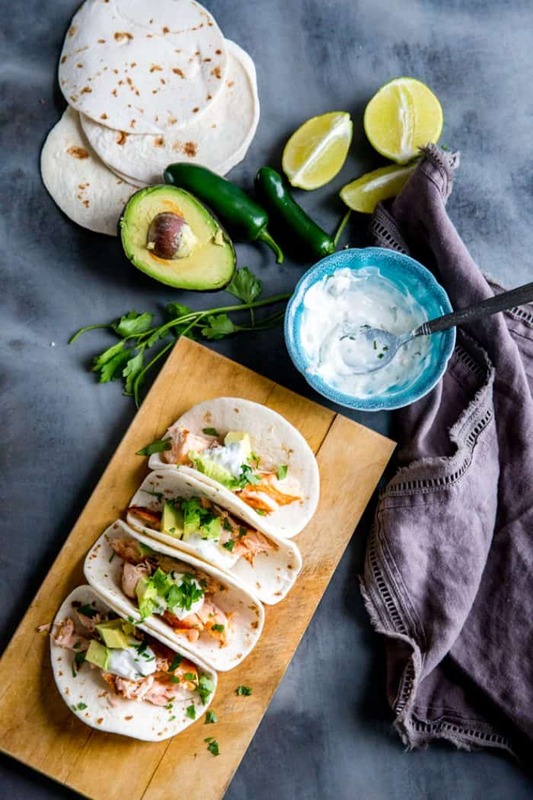 These tacos are made with spicy salmon and are topped with a jalapeno cream! Salmon tacos feature fresh salmon that is fully seasoned and cooked to perfection! 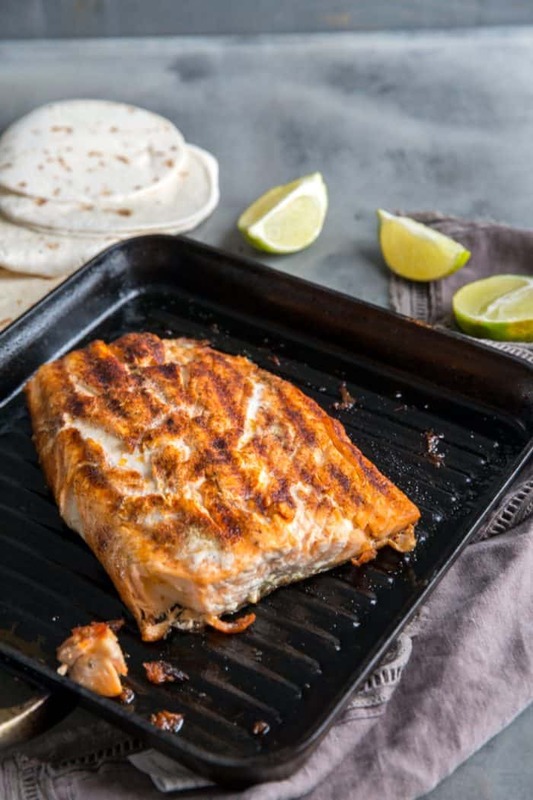 The salmon is delicately placed in soft, flour tortillas and topped with simple topping! This is a light, simple, low-stress meal that can be enjoyed all year long! Salmon tacos, or any fish taco, are usually quick cooking so you get dinner on the table in a flash. As far as fish go, salmon can be a little “fishy” tasting but the seasoning blend on this salmon will mask that making this a great dish for those who are on the fence about eating salmon. WHERE IS THE SALMON TACO RECIPE? 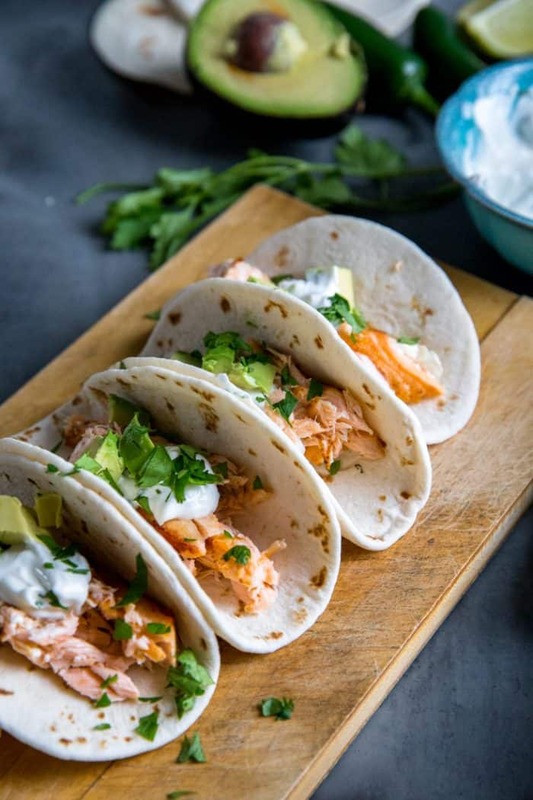 If you’d rather skip cooking tips, suggestions, handy substitutions, related recipe ideas – and get straight to the Salmon Tacos Recipe– simply scroll to the bottom of the page where you can find the printable recipe card. What To Add To Salmon Tacos? Since the salmon is so nicely seasoned in this recipe, I don’t bother to add much to the tacos themselves. I made a super easy jalapeno cream using sour cream, freshly squeezed lime juice and fresh, sliced jalapenos. You can change the number of jalapenos called for in this recipe and while you can use canned jalapenos fresh peppers are so much better. They offer a crispness to each taco. I added cubed avocados to my toppings to cool the heat from the peppers and the seasoning and fresh cilantro add a bit of color. 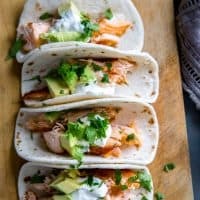 What To Eat With Salmon Tacos? I like to serve these fish tacos with this avocado feta salsa, and this Pico de Gallo on the side if you would like to balance the heat. Mexican street corn would round out the meal. Of course, black beans, Mexican rice or a fruity salsa would be wonderful as well! Salmon tacos are one of my favorite summertime meals! They are the perfect light dinner! These tacos are made with spicy salmon and are topped with a jalapeno cream! Combine chili powder, cumin, onion powder, paprika salt and pepper in a small bowl. Rub spice mixture over salmon. Cook salmon in olive oil in a preheated skillet or grill pan. Continue to cook salmon until no longer pink, about 4 minutes per side. While salmon cooks, combine sour cream, lime juice, jalapeno, cilantro and salt in a bowl. To serve, place salmon in a warmed tortilla and top with jalapeno cream. Serve with avocados and salsa if desired. I love salmon, which is pretty ironic because for the longest time, I didn’t like it all. Now that has completely changed. These tacos sound like a perfect summertime meal! The cream sauce sounds wonderful! The cream was so good! Thank you! Your recipe for Jalapeno cream sounds great! I love hot and spicy peppers. Nothing better than spicy peppers. Thank Raquel! Fish tacos are a favorite of mine, and I love that you used salmon. I always have salmon but haven’t thought to use them in tacos. This looks like one great recipe! The salmon made excellent tacos! The family loved them. Thank you Marcie! 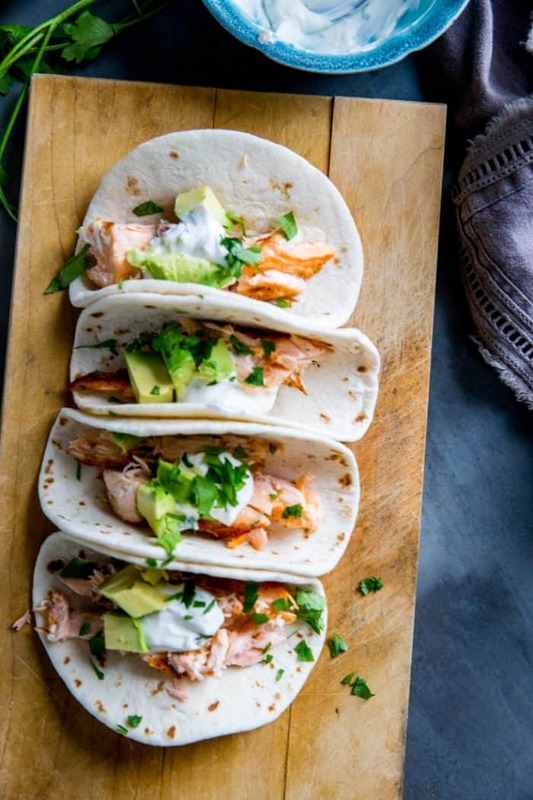 I love anything spicy and salmon…love how you made these tacos! Pinning! I love anything spicy too Gloria! I’ve had fish tacos at a restaurant once with salmon instead of a white fish, and they were fabulous! You just reminded me to make these some time!! I’ll use your recipe – it’s perfect. I hope you do Mimi! Thank you! A great post, Tanya. Wonderful to watch a child grow a little bit right before your eyes. 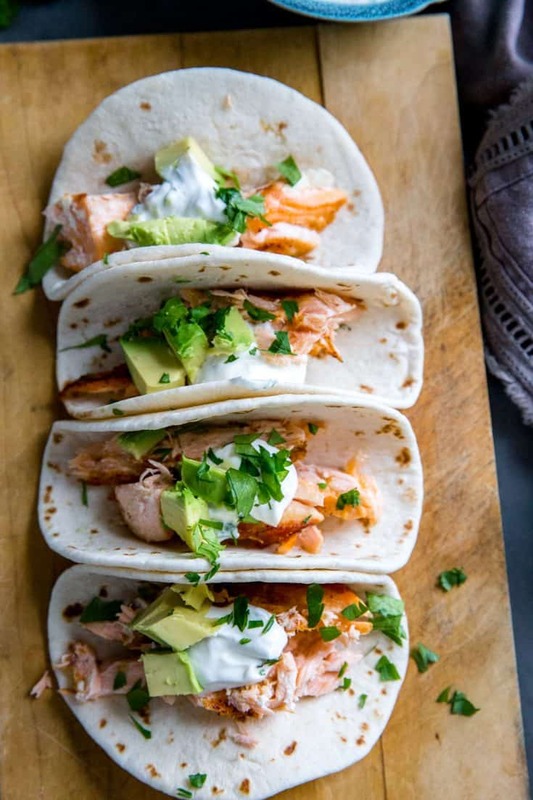 Your salmon tacos sound delicious, using some great spices and herbs, with a little jalapeño for a kick. Wow, I love your Salmon Tacos! Looks like a very healthy dinner. I usually stick to chicken or beef tacos, but would like to try fish tacos at some point. I like the jalapeno cream that you’ve made to go along with this dish… I would need something like that to help cut down the spice! Thank you Amber! I love Salmon! Awe, that’s such a sweet story about your daughter! And of course, those salmon tacos are to die for!! And, I actually have salmon in my freezer right now which is super rare. Salmon in the freezer? I see tacos in your future! Also– I live in NC! Which beach? We have the best beaches. We go to Oak Island every year– it is by and large my favorite. I was just talking about Oak Island! We were at Topsail Beach. Oh my goodness! This looks fantastic and I want some right now…..at 10 PM….yep, I do! I could eat these at 10pm too! Thanks Kelli! I’ve been eating salmon 4 times a week, probably too much, but this is something I’d like to try! Wow 4times a week? I hope you enjoy this recipe! I’m crazy for jalapeños! Salmon makes excellent tacos! Love the story about your little one! My three are all older now, so I get to relax at the beach now which is great! These tacos are also great! Love the spicy salmon in them! Someday I’ll actually read on the beach! Thanks Jocelyn! I will be smoking salmon for some friends of mine and I will be making your jalapeno Cream Sauce. It sounds so good. I would love it if you would join our BBQ Block Party-Linky Party on Thursday. Thank you Shawna! I hope you enjoy the sauce! This so sound delicious and your post also reminded me of the wonderful time of young children and their discoveries. The time may fly and our hands get a little further apart, but they always need us. 🙂 Pinning this yummy recipe! Thanks Cindy. I know there are days where I still need my own parents! Such a good analogy about parenting! Loving these tacos, too! Oh yum! This is totally on my menu for this week! Wanted to let you know that I’ve put together a round up of outstanding fish recipes, and I wanted to include yours. A photo from your page will only be in a collage so that it cannot be “swiped” by anyone, and only the name of your recipe along with a link and your blog name will be posted so that folks have to come visit you to get the recipe! It will go live in 2 days, and please do let me know if you don’t want it shared for some reason. Thanks again; so excited to try it! Thank yo so much for sharing Tiffany! Try the Florida Gulf Coast, it’s a lot warmer, smaller waves, and pristine white sand. (yep, I’m a native, :D) Thanks for the recipe; these look amazing. I wish I could try the Gulf Coast right now!! Thank you Gigi! Such a sweet little anecdote, Tanya! I love your Lucy story 🙂 And I’m loving these delicious Salmon Tacos too…not too little, not too much….just right!! Thank You so much for this healthy tasty recipe. I like spicy & this is a helpful addition. Thank you Kristin! This comment couldn’t make me happier! I love that your husband makes this for friends and family and adapts them as needed. That is the biggets compliment! Thanks for taking time to write. Salmon is my favorite!! I love the jalapeño cream! Hi Tanya, My daughter just rediscovered liking salmon this is perfect for our family to try. Thanks for sharing your recipe at the Inspiration Spotlight party! Pinned & shared. Have a great weekend. What wonderful memories for your daughter!!! My husband and I love fish tacos but we’ve never used salmon. We’ll definitely try them this summer!! These tacos look FANTASTIC! Thanks for sharing this at Craft Frenzy Friday on Mom Home Guide! Pinning! I’ve never had fish taocs, but those look delicious! Thank you for linking up to last week’s Tasty Tuesday linky. I have pinned your recipe to the Tasty Tuesday Pinterest board. I hope you’ll join us again this week. Love fish tacos. Had not thought of using salmon. Will definitely have to give it a try. I want these for taco Tuesday!